Mary Berry's "Plainchant for Everyone"
Why is chant making a big comeback? The Church Music Association of America is making fast progress on printing a new book. 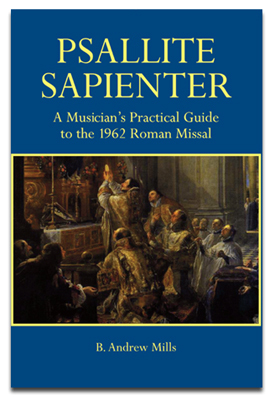 It is called Psallite Sapienter: A Musician's Guide to the 1962 Missal. It is by B. Andrew Mills, the marvelous and learned organist at St. Agnes in New York. It is the one reference that every Catholic musician needs to provide music for the extraordinary form. He has been thinking about the need for this book for many years, and writing it for the past year. Now, of course, it is more needed than ever. It is indeed comprehensive and super clear -- my friend Scott Turkington points out that it makes an excellent substitute for libraries of material that people tend to buy. It covers the types of Masses and what is required, and the expectations and needs of the full liturgical year, plus weddings, funerals, Benediction, and etc. It combines a comprehensive understanding of the rubrics with the author's own extensive experience in the EF, which is particularly useful since the author understands the ordinary form as well and the differences -- and helps make the transition easier. It tells musicians just what they need to know, in a beautifully typeset book with numbered paragraphs and a clear index. We have it set to sell for $13. Actually, while we wait for the full print run to be available in Catholic retail stores, you can buy it here.